In these challenging times for media, tech and the wider economy, it's entirely right that people are increasingly questioning the value of industry events and demanding more amid all the intoxicating smoke, mirrors and punchy pricing. During my near-15 years in events, I've seen a lot of good things - imaginative solutions, inspirational ideas, new start-up collaborations, entrepreneur exits, big jobs secured, major client wins and exciting partnerships. Like many others, I’ve also schlepped across cities, countries and continents only for the investment of my time and money to be rewarded with endless sales pitches, uninspiring content and soulless, disjointed events. I’ve heard some of the current crop of marketing events described as unimaginative, staid, greedy, extortionate, complacent, formulaic, broken and boring, sometimes with good reason. Across various industries, the traditional large trade show hasn’t evolved all that much in at least 40 years. This is why I quit my job and, alongside my co-founder Ian Houghton, launched MAD//Fest London - an invite-only marketing, advertising and disruption festival designed to challenge the trade show model. Brimming with ideas and encouragement from industry friends and equipped with a box of sharpies, a white board and seed funding from the hugely supportive Mediatel, we set about taking on the big boys and shaking up the increasingly wobbly exhibition model. Last November, we used an invite-only approach to pack 2,700 players into The Old Truman Brewery, 90% of whom were brands, agencies and publishers (thereby inverting the usual buyer:supplier ratio of large events). 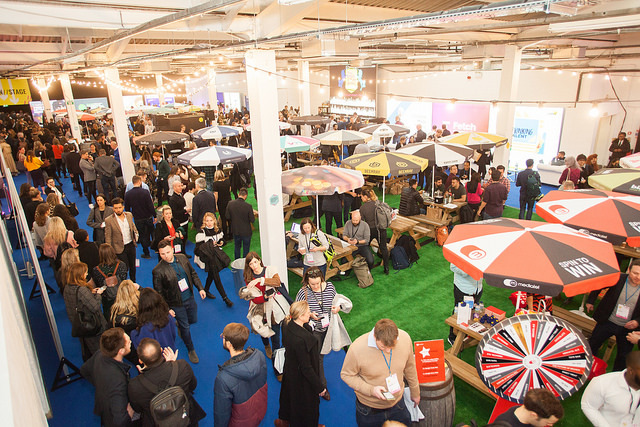 Mindful of not wanting to create another Olympia-style shell scheme nightmare, we replaced the traditional exhibition with a giant connected pub and garden kitted out with immersive tech. After all, most marketing folk like nothing more than meeting new people and hearing and seeing cool things over a pint. We packed the programme with CMOs, disruptive brands and entrepreneurs and developed our 'Fix It, Pitch It, Hack It’ format to keep the content punchy, focused and useful. Sessions were limited to 20 minutes, avoiding the prospect of a slow and painful death by pitchy PowerPoints. While there's quite a few things we'll be doing differently this year at MAD//Fest and our latest launch MAD//Picnic, two first-time founders and a couple of brilliant part-time freelancers combined enthusiasm, ideas and hard graft to do this all in less than 6 months - an adrenaline-fuelled experience typifying why I love events. Necessity is the mother of invention and there is an appetite for something new among time-poor brands, agencies and publishers. Sponsors are tired of the same old formats and are willing to back a new horse - especially start-ups, scale-ups and mid-size tech businesses who are looking for more value, charisma and a level playing field. By putting energy and creativity into re-thinking the event experience, us organisers can change the way people can immerse themselves in conversation and ideas, stop people nodding off during another programmatic panel and prevent the collective nausea caused by an endless sea of shell scheme stands. At the risk of ruling myself out of ever getting myself a normal events job again, I'm not entirely convinced that this approach fits neatly on the well-oiled production lines of multinational trade show organisers, where all-too-often a one-size-fits-all mentality prevails. Trade show organisers are obsessed with scale (as shown by current M&A activity in the events industry). Internally and in marketing promos, I've repeatedly heard events referred to in square metres. This means little to me or our customers. Product innovation is slow. And here lies the problem. What large event organisers want isn’t necessarily what people want. With exceptions, many organisers persevere with business models that will placate shareholders and sustain their high cost structures. So they try and make people want established event formats and pass on their costs to sponsors, exhibitors and attendees. Frankly, I’m not convinced many large organisers care all that much about the marketing industry when there's much larger profits to be made from running construction, energy or pharma exhibitions in fast-developing parts of the world. Thankfully, there are organisers and entrepreneurs out there who care passionately about the marketing industry and take a different approach. I’m impressed with OMR in Hamburg and D&AD here in London. We’ve challenged some illustrious competition by making a unique experience simpler, more effective and fair. If people who sponsor or exhibit at large marketing shows have had enough, the best thing they can do is vote with their feet and look elsewhere. All too often, you hear sponsors and exhibitors at shows who aren’t exactly glowing about the experience, eye-watering cleaning costs and time spent on activation. Then you see them the following year at the same event, with the same stand and the same unhappy face. This is particularly true of larger firms who tend to take fewer risks. The saying goes “Nobody got fired for buying IBM”. But if the event equivalent of IBM turns out to be a Commodore 64 in a shiny box - once cutting-edge, now slow, cumbersome and superseded by faster, cheaper and more powerful machines - there’s a responsibility to dig deeper, look at the alternatives and ask whether mere posturing justifies the investment. So dare to be different - after all, doing the same thing over again and expecting different results is the very definition of madness!